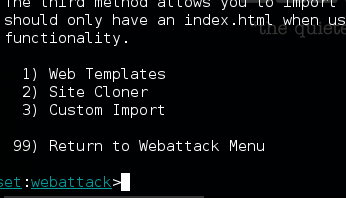 Create Website Clones using Kali Linux. 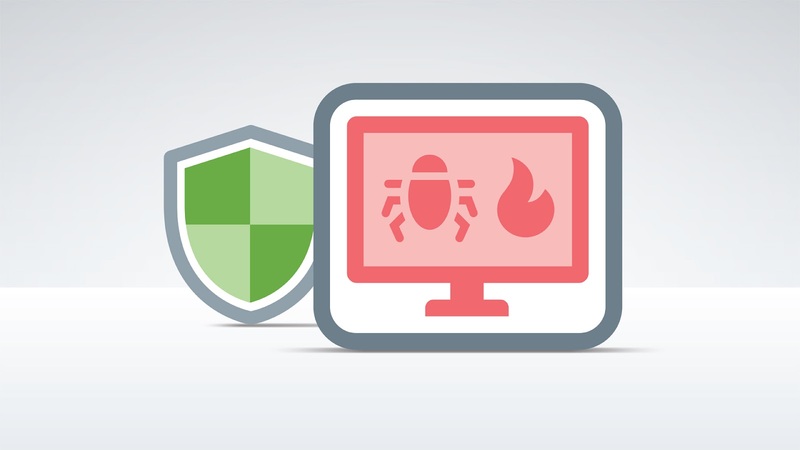 Today's Post Is Really Very Interesting Because In This Post, I am going to show you how you can Create a login page clone by using KALI LINUX . So, let's Start Today's Tutorial With Some Basic Queries. Q 1. What Is Website Cloning? Ans. Website Cloning Is a Process In Which A User Or Program Create Duplicate Copy Of Any Specified Webpage That's Completely Looks And Behave Similarly like Original Page. In This Process, A User Can Use Any Cloning Programme Or Can Also Do Manually. Basically, In This Concept We Copy Html Codes From Original Site And Do Some Editing In Source Codes To Full Fill Our Requirements. Q 2. Why Hacker's Use Website Cloning Concept? Ans. Well, With The Help Of This Concept A Hacker Can Create Duplicate Copy of Original Site To Interact With Victim In Place Of Original Site That Can Cause Victim Data leak Or fraud. This Duplicate Webpage Trap is also called Phishing Page. Website Cloning Also Helps Hacker's To Find Vulnerability In Website Source Code. In Short, Website Cloning allow user to Collecting Different Types Of Source Code Information Without Visiting Real Website Again and Again Because All Websites logs client IP address that can cause big problem for hackers. Now, Let me show you practical example of website cloning. Here, For Practise Purpose We will try to create a Clone Page That's Will Look And Behave Like Login Page For Collecting Victim Confidential Data Using Kali Linux Social Engineering Toolkit. 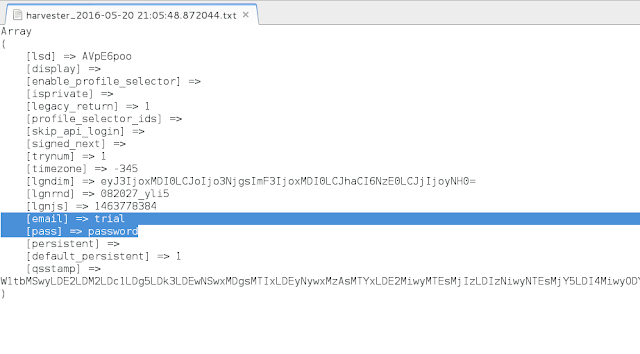 Basically, We Will Redirect Victim Browser To Our Set-up Duplicate Server. This Duplicate Server Will Host Our Specified Cloned Webpage That Interact And Behave Like Original And One Of The Best Feature Of This Page is, This Page Will Save Victim Login Data In Our Local Drive Instead Of Posting data To Original Server. NOTE : THIS TUTORIAL IS ONLY FOR EDUCATIONAL AND SECURITY PURPOSE ONLY.IF YOU MISUSE OR MISTREAT THE ABOVE INFORMATION,THEN IT CAN BRING UNLAWFUL CHARGES BY THE PERSON ON WHOM YOU SET THIS TRAP.THE AUTHOR WILL NOT BE RESPONSIBLE IN THE EVENT ANY UNLAWFUL CHARGES ARE BROUGHT TO YOU BY ANY INDIVIDUALS BY MISUSING THE ABOVE INFORMATION.WE WON'T TAKE RESPONSIBILITY FOR ANY OF YOUR ACTION RELATED TO ABOVE INFORMATION. 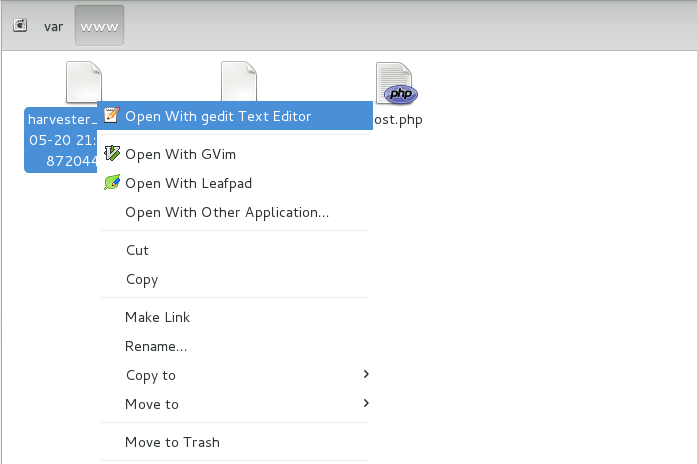 Open terminal using Ctrl+Alt+t or click on the small black window image on the top left of your screen. Once terminal Open, type Below code carefully. This Command Will Show You Your IP Address. Note Your IP Address. 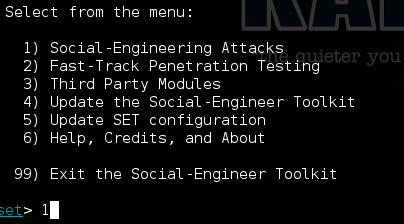 Now in Next step, open social engineering toolkit. 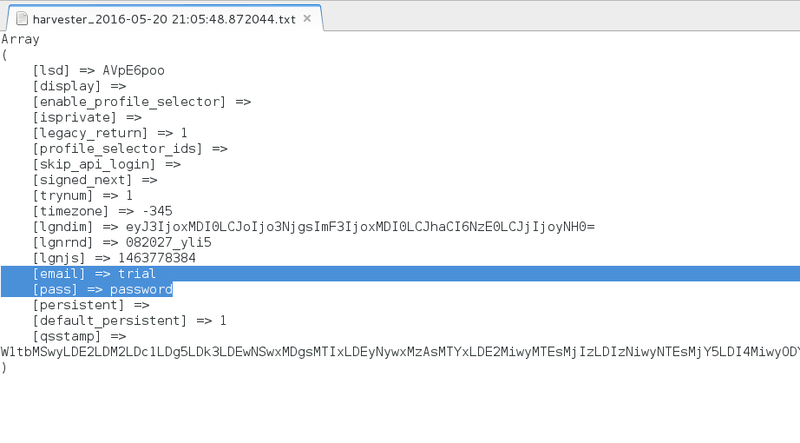 To Open Social Engineering Toolkit type below command in terminal. As shown above in image, Press "1" and hit enter as we are going to do Social-Engineering Attacks. Now, Again In Third Menu ... We Will Select "credential Of Victim" Because Basically In this method,we are going to steal the credential of the victim so press " 3" and hit enter as it will select credential harvester attack method. Then, You will See new menu as shown below in the image. so we need to trap the victim in a Duplicate page Of original website page(like phishing page) and for that we need to clone a webpage. press "2" and hit enter which will open something like shown below. Please note that if you don't put your computer IP address Correctly. This method won't work. So, After entering your Correct IP address, hit enter. 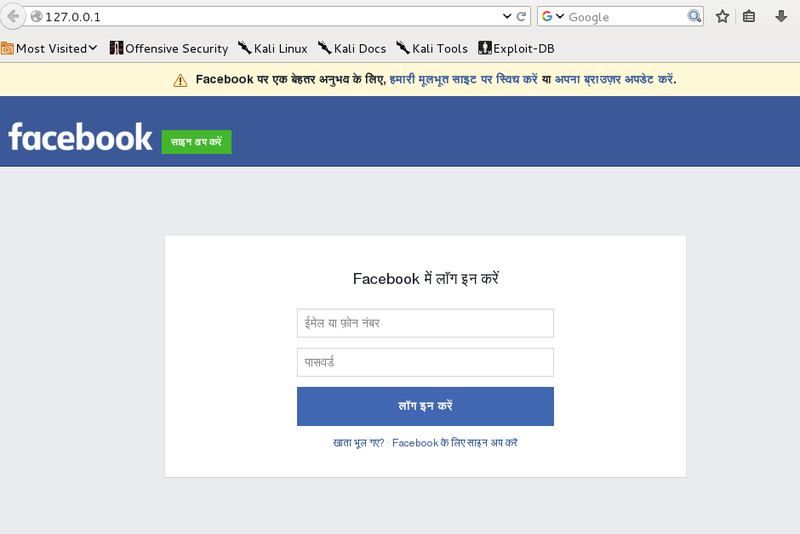 Here, i had entered "http://www.facebook.com" as i want to steal someone Facebook account Data. After the process is completed. The next step is the most important step. and Also make our IP address online available. In Short This Server Will Handle Client Browser who visit Our IP address, will see our cloned page which will look like Original Website. In this step, To Increase Your Success Probability I Will Suggest you to shortened your IP address by using services like ADF.LY, Binbox, Goo.gl,etc. Once you enter your ip address on these sites to shorten, they will provide you a short link, then all you need to do is just send this shortened link to your victim. url you had entered to clone the website. /var/www/harvester path as screen shot given below. In this example, I used facebook.com. But You Can Use Any Other as Your Requirements. Please NOTE :- Victim can identify that the page is a trap as the address bar of browser will be having your IP address.For best results,send the shortened url to victim mobile and ask them to visit urgently,or you can say visit this link and login to get latest updates of their favourite contents,etc.